So for years and years and yeeeeears I've been faithful to my Estee Lauder Double Wear foundation. Having oily/combination skin I need a foundation that will last all day, one that won't budge and slide off my face half way during the day. I also like a good coverage and my double wear ticked every single box! Aside from using foundations from another brand I used to work for (which I got for free) I've never bought another foundation in probably ten years... that's some commitment there! Now I think Estee Lauder have changed their formula, although apparently they haven't, but something feels different with it, I can't put my finger on it though. Anyway.... I was in MAC and after a concealer, I ended up walking out with a sample of Pro Longwear Foundation (along with some other full sized products I hadn't intended on buying!) I loved it straight away. I found the coverage was really good, it did a great job at hiding and smoothing my open pores (they were quite large for a few months) and it lasted on my skin for most of the day. I ended up buying one and I'm really loving it. I find it kinda spreads further than Estee Lauder does as I'm not going through it as fast as I did with double wear. I'm now splitting my week up between the two foundations, trying to allow each one some quality time on my face whilst not making the other one feel neglected! Ha!!! I'm still more towards Double Wear but Pro Longwear is definitely a close second, so that's why it's made it's way to this list! This is like a concealer and highlighter in one. It does a great job at concealing any darkness under the eyes, whilst at the same time making the eye area look a lot brighter. I sometimes use a concealer and a separate highlighter pen, especially if I'm looking really tired but on a general day to day basis this does a great job on it's own. It's very light and doesn't sit in the lines around the eyes. I find it very easy to blend in as you don't need to use a lot of it. I tend to do two thin coats, with the second thin coat applied mainly under the inner part of my eye (near the nose) Because it's a light texture it doesn't crease throughout the day. I have a feeling this may be getting discontinued though as I can only find it on Superdrugs website and also the shade I use is out of stock. I do hope this isn't the case as I've nearly ran out! ha! Ok so technically this is classed as a foundation, now personally I would think you will need near perfect skin to get away with this instead of using a foundation and seeing as I don't (I suffer with some redness on the cheeks and nose) there is no way I'd be able to use this alone, I just feel it doesn't give anywhere near enough coverage to do that, although I do find it to be an amazing finishing powder. You literally barely need to use anything for it to set your foundation. I just dab my brush over my face, let it sit for a minute then run over my face with my brush (with no added powder) to get rid of any excess powder and to ensure it's all blended in. Since using this people have commented on how smooth my foundation has been looking and it definitely reduces any shine from breaking through too early in the day. Now if I'm going on a night out I will use a bit more of it to ensure maximum coverage, but on a day to day basis a little goes far. I had always used No7 pressed powder but since moving on to this I haven't turned back and although this may be £10 more, you actually get more product, I'm pretty sure No7 pressed powder gives you 10g and this gives 15g. This is lasting me much longer so I'm not having buy one as frequently. This is my MUST HAVE powder! this much! I'd had a make over done on one of the Bobbi counters by a friend and bought a few bits and that's why I never noticed! I'll be honest, had I not have had a make over done I wouldn't have paid this much BUT saying that, I LOVE it!!!!!! It's the perfect shade, not too dark and not too light. 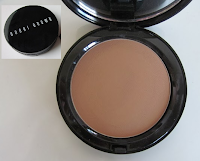 It's the ideal colour to contour with (for my complexion) without worrying about getting heavy lines. It's easy to blend in and if you apply a little too much you can just use a stipple brush to lighten it up. It's also a matte brozner, something I'd never had before. I'd only ever used shimmery bronzers, but then I never contoured with it, I just dusted it lightly (or back in the day heavily) all over the face. Now to contour with you need a matte bronzer, you can add any shimmer afterwards, but we don't want to highlight the areas we are trying to draw in. What I love about this, is that it isn't powdery at all, so your not wasting a shed load of product as you swirl your brush around it, this will help the bronzer last you much longer than other powdery ones. This has been the only bronzer I have used since buying it, I love it that much! That being said I've bought a few other brands that are cheaper to see if I can find a good dupe, I haven't been successful although one of NYX bronzers came close, but it's quite powdery. I have just bought another one and will use it a few more times before I decide on which one I prefer. If Your after a high end bronzer, one that will last a long time and isn't powdery, that comes in great packaging with a good sized mirror then go for this one. So I'm always looking for a good red lip liner, one that will help my lipstick last and not bleed, which always seems to happen. Now my favourite one here is the Riri Roo lip liner, but unfortunately that's no longer available, although they do have some great alternatives on their website. I bought this along with the Riri Roo lipstick. It's super easy to apply and glides on so easily. The lip liner isn't very drying and holds my red lipstick on really well, preventing a lipstick that normally can bleed from bleeding. The only problem is, is that I keep needing to sharpen it to keep it having a nice point to it, so I'm going through it like no business. Which leads me on to the NYX lip liner, I needed to find a good replacement for when I do run out. The colour isn't exactly the same and it does take a little more time and effort to apply but overall I'm happy with the results, it keeps lipstick on and again is good for preventing lips from bleeding. I don't think I will go through this as quickly as it's not as soft and also doesn't need to be sharpened like the MAC one. I've bought a few more NYX ones, for the price they are bargains and I'm equally as happy with those too. So like most people in the beauty world, I was excited about Rihana's line this Autumn, I'd missed out on the previous collection and was determined to bag a few lines this time, which I did. I was especially excited about the Riri Roo Lipstick, something people raved about all over the interweb and if this was the only product I managed to get I would have been happy! Turns out I ended up buying the matching liner and lipstick plus a few other bits but anywhooooooo, moving on! I was in desperate need of a true matte red lipstick, I'd been told to hold off buying Ruby Roo as Riri was nicer, I took the advice and waited. I wasn't disappointed. I LOVE the lipstick, it's my favourite red and just looks perfect on a night out with smokey eyes OR teamed up with just a simple black line on the upper eyelid for a bombshell Hollywood look... well I think so anyway! Now it is quite drying on the lips so make sure you have kept your lips nice and moisturised prior to wearing and afterwards. The great thing is, is that the lipstick stays on, it doesn't smudge, even after a sambuca or 3! Which is a big bonus as you're not constantly reapplying or worrying that it's wearing off during the day/night. I hadn't worn a red lipstick in so long and this has given me back my love for red lips! I will say I have since gone on to buy Ruby Roo and there isn't a huge difference, not a big enough one that someone who hadn't owned either would notice so I would recommend going and buying Ruby Roo as an alternative, now the packaging may not be as pretty but come on, we don't buy things for the packaging........... do we??! I have a huge love for NYX right now. All their products are a great price with amazing quality and their lip products are no exclusion. I'd been recommend beige from a friend, and was weary as I thought it would be a beige colour lol, turns out it's not, it's a gorgeous pink that will go with anything you wear on your eyes. The smell of them OMG, they smell gorgeous, like beautiful!!!! It's not too sticky and seems to wear quite well on the lips. I tend to team it up with a lipstick underneath most of the time. The Lip Butters are new lines to NYX and everyone on facebook were raving about them so I decided to try them out, unfortunately for ages I couldn't get hold of the colours I wanted, of course I'd want the most popular colours! They glide on the lips so well, they leave your lips feeling smooth and also looking gorgeous. The scent of these are even nicer than the mega shine lip glosses. They actually smell like the tastiest fruity desert you've ever tasted! They are creamy but yet silky and definitely stay on the lips. The texture is slightly thicker than the mega shine glosses but please don't mistake that with them being gloppy, because they're far from that. I'm going to be buying a few more shades once they're back in stock! Right so that's it for part 2 of my 2013 beauty favourites. Tell me, what face and lip products have been your favourites of 2013?